I cannot find my past thread on this subject. Is there any other way of fixing this problem. The wheel does not ride up so the drum covers the brakes. I tried with and without a key wedge. I tried both wheels on both sides. There is the same distance gap with both wheels put on both sides. The only advice I was given in this situation is to remove the rear and take it apart and shorten the axle. Any suggestions are appreciated. As long as you're sure that nothing is hitting something else and holding it out, it seems that your choices are to use a hub with more wear in the taper, use shorter axles, or ignore it. I don't see what harm it would cause to run it like that, as long as the hub is tight on the axle. Your previous thread says all rebuilt with repo parts. Are they the longer axle's? The guy's seem to say the repo longer one's are 1/16 to 1/8" longer. Your wheels look re-spoked also. Did you replace the hubs too? Your gap looks bigger than 1/8" longer axle's would cause. Could this be due to new axles/tapers just not allowing the wheel to go on deeper? Really stupid question: Your not hitting the shoes or the seal, right? Is that what both sides look like AFTER you have tightened the axle nut TIGHT to pull the wheel hub onto the axle taper ? I can't see how the new 1/16" longer axles could allow that much gap. Does any one know where the extra length is on these repo's? If he has the old axles can he measure from some point and see if that's the problem? Measuring/compairing the tapers on the new & old axles and on the hubs might give answers. Made of high strength Steel Alloy 4140, these axles are stronger than the original Ford axles and much stronger and harder than other modern replacements. The hardness of these axles is between 38 and 41 on the Rockwell C scale. In addition to the improved strength, we make our axles 1/16" longer than standard to eliminate the common need to use shims to compensate for worn hubs. The extra 1/16" causes no problems if your hubs are not worn or if you use modern accessories such as floating hubs or Rocky Mountain Brakes. As for the wheel/axle in question, I would think something else is amiss. Like hub nuts hitting the brake shoes, or seal not all the way set, or crud in the hub, something is not letting the wheel set fully. I would clean the hub taper with fine crocus cloth on a wood stick, and clean the taper of the axle, then retest. Or remove the brake drum, and retest, or remove the brake shoes, and retest. Something is amiss. But after all that careful checking.....and you can snug the daylights out of the hub on the axle shaft with the key in place, then run it! Normal look of proper assembly. I agree with Dan's post and photo. 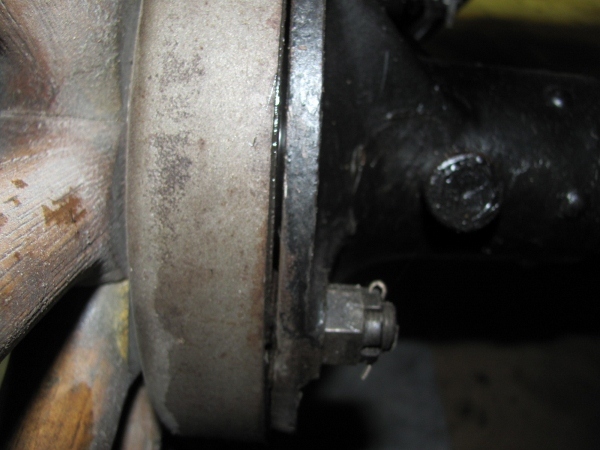 Many people don't recognize the correct position of the hub/brake drum on a new axle. It should set out as shown, not cover the backing plate. Mine is the same as Dan's photo. And they are older original good axle's. Tighten the wheels securely, run it and don't worry about it. Do as Dan says and clean the hubs really well and make sure nothing is stopping it from going on all the way. The fact is, there is no need for an axle to be 1/16" longer. A worn hub, really? If you have a hub, and it is properly keyed, how is it going to wear, unless some jackass didn't tighten it up enough. Have you ever seen an original Ford axle nut wrench? Gosh, I think with that kind of leverage it would strip the threads. No folks, just made the axles like Ford did, and the same length too. If you have a hub, and it is properly keyed, how is it going to wear, unless some jackass didn't tighten it up enough? Good question. Where did all these worn hubs we hear about come from? Did that many people drive around with the wheels loose on the axles? I think they did. We know that we need to re-torque the axle nuts after driving them for a while, but that's because we're on this Forum. Does the owner's manual say to do that? If you bought a used Ford (without a manual), how would you know to do that? There definitely are a lot of worn hubs out there, and it's pretty unusual these days to find one that's not worn. "Did that many people drive around with the wheels loose on the axles?" "A worn hub, really?" The answer to your questions are; ABSOLUTELY! And, they still do. When I helped do MTFCI pre-tour vehicle inspections, loose rear wheels were the number one problem I found. (I'm not saying just a little bit loose either.) You would be surprised, (and scared), to know how many T's have loose wheels right this minute. What I think is totally stupid is screwing up the design of a new part so that a junk, worn out mating part can be used. every car i have ever owned regardless of make, if it has tapered axles, they were loose when i bought it. Measure from the center line of the punkin to the outside of the backing plate. Both sides should be 26". Not only are worn hubs pretty common, the key way is usually pretty badly worn or totally shot. And where do you think all those old axles with the busted out key ways came from? A lot of this stuff has come from old hay wagon conversions. When the bearings gave out they just kept running them which is why you can come across front spindles that look like they're partially cut through. Nobody ever tightened anything up on these things unless it fell off. Worn hub with a bad key way plus a new or good used rear axle = a bad axle eventually. Axle with a bad key way and a good hub = a bad hub eventually. Nothing on that taper should be able to move when it's together correctly. I don't put hubcaps on until I've driven a couple hundred miles and had a chance to cinch the hub nuts down a few times (new cotter pins also with each tightening.